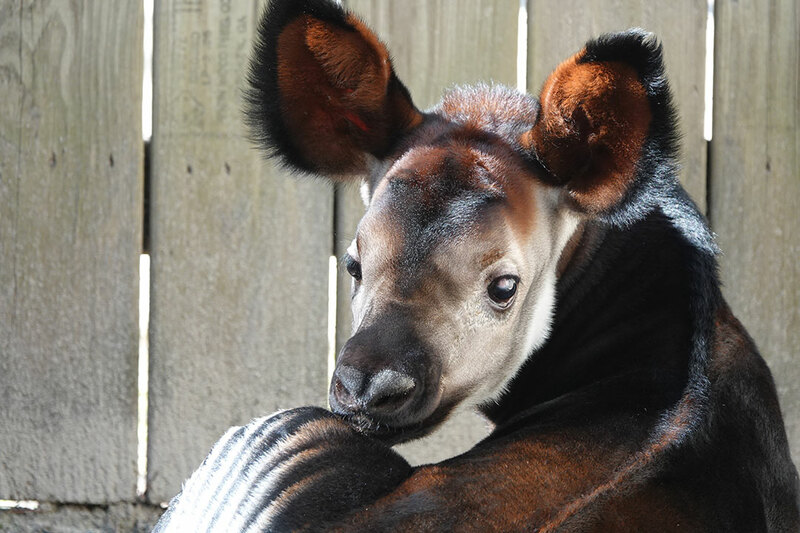 Gainesville, Florida — Six weeks after receiving a groundbreaking procedure performed by a University of Florida veterinarian to correct a rare eye abnormality, an endangered okapi calf is recuperating well at White Oak Conservation Foundation in Yulee, Florida. Caryn Plummer, DVM, an associate professor of ophthalmology at the UF College of Veterinary Medicine, served as the primary surgeon, collaborating with White Oak veterinarians in the procedure, called a keratectomy. It was the first ever reported to be performed in the species. “Mom and calf are doing great,” said Kyle Donnelly, DVM, a third-year zoological medicine resident at the college who, through a decades long collaborative relationship between UF and the center, also serves as White Oak’s resident veterinarian. 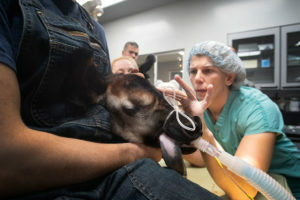 The arrangement provides additional training to UF zoological medicine residents while supplementing the strength of the center’s on-site veterinary medical team. Maziwa is examined by Dr. Caryn Plummer, associate professor of ophthalmology at UF College of Veterinary Medicine. A large group participated in the procedure, including Plummer as primary surgeon, Donnelly, White Oak veterinarians Scott Citino, DVM, and Jessica Emerson, DVM, and second-year UF zoological medicine resident Jane Christman, who drove to White Oak with Plummer to scrub in. Read additional articles related to eye surgery in the Ophthalmology section of Today’s Veterinary Nurse.